Wayne Fromm the original of the selfie stick needed a digital marketing partner. The Quik Pod website was a hybrid concussion of the Shopify eCommerce platform and the WordPress content management system. While functional it was hard to use and less than SEO friendly. We proposed moving all of the WordPress content over to the Shopify platform, making it a single platform easier to use system. Once completed, we ensured that all previous indexed links to changed pages were correctly redirected to the new pages on the Shopify platform. This kept the keyword ranking and earned topic relevance intact. The website also received a partial redesign for the main pages as well as 30 hours of manually on page optimization. That combined with a link outreach program has increased the websites ranking and traffic in less that 90 days. The website conversion numbers also increased, up 15% in the first 90 days. 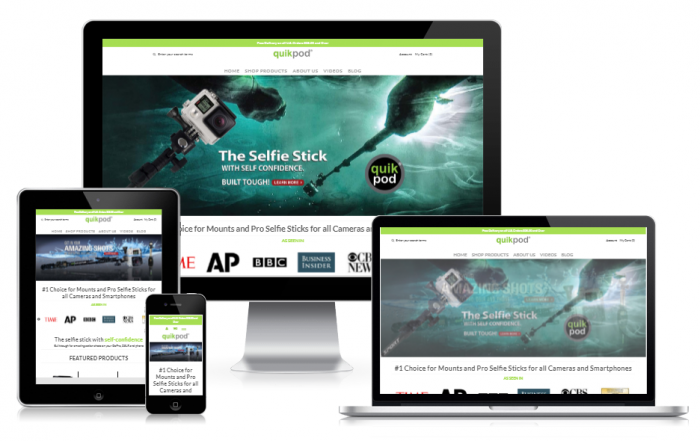 As a busy brand, Quik Pod had a lot of social media to manage. We showed them how to use social automation tools like Agency Analytics as well as internal processes to drive the social media marketing plan forward.